Crispy Skin Barramundi | Strictly.Food. I’m a stickler for fish with crispy skin. Thanks to some guidance from Gordon Ramsay, once I learnt the technique for it I never really looked back and if we’re being honest, who can blame me? I’m a massive fan of crispy skin Barramundi in particular. The combination of flaky white flesh with a crispy skin can make a winner out of any meal. For the dish I created, I decided to use parsnips, which in my opinion are massively underrated. If you haven’t tried them before do yourself a favour and either make some fries out of them, or even cut them up and bake them. They really are a nice alternative to potatoes and have a wonderful flavour. On the side I served beans which were inspired by the beans they serve with the pork belly dish at Piato. This dish is really easy to make, you just need to get your timings right and have everything prepared and ready to go! First up, get your oven on to 180 degrees and get a medium pot with water on to a boil. Next, prepare the Barramundi fillets. I like to trim the tail end so it cooks evenly and looks neater but this is up to you. As per Gordon Ramsay’s video I put up earlier, score the skin length wise at very narrow intervals. This will help crisp the skin up. Cover up with cling film and set aside. Once the oven is preheated, take the garlic cloves, put them on a tray and into the oven for about 15 minutes. Make sure you don’t overcook them or they will literally go off like garlic bombs! Peel the parsnips and cut them up into small cubes then add them to the boiling water with a pinch of salt. Cook these for 15-20 minutes or until soft then drain. For the beans, rinse them with water to get rid of the can juices and drain them. Next, chop the pancetta. I like my pancetta to be quite chunky but if you like smaller pieces this is fine. Add it to a medium hot pan and render the fat out until it starts to become crispy. Add the crushed tomatoes, cream and beans. Simmer for about 10 minutes. The sauce should begin to thicken by this stage. Once the garlic and parsnips are done, add them to a food processor with a pinch of cumin, butter, milk and salt to taste. You are after a super smooth consistency. Return the puree to the pot and keep it on a super low heat stirring occasionally. Finally, the Barramundi. Heat up a pan on a medium heat, add a little vegetable oil and place the fish skin side down. You want to watch the flesh turning white until it travels half way up the fillet then turn it over until it does the same. Rest the fish for 5 minutes. 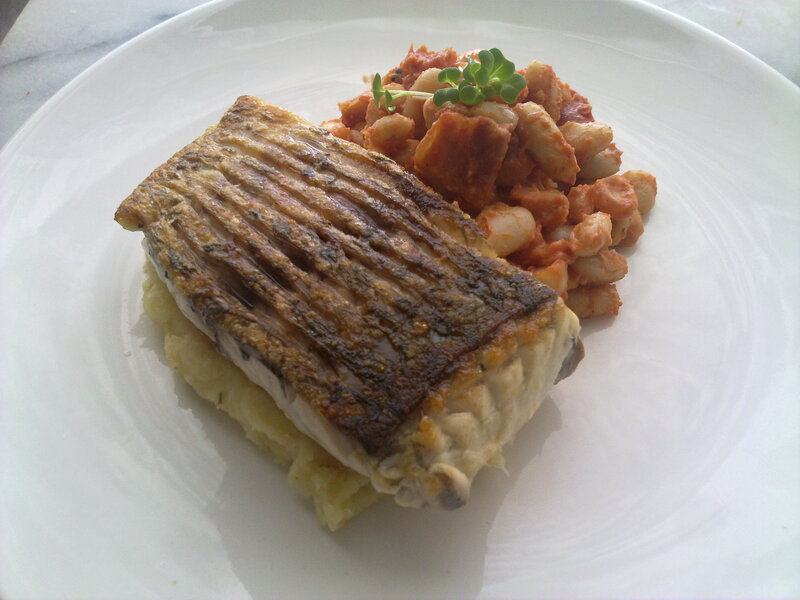 Add a scoop of puree to your plate, place the Barramundi on top then serve the beans on the side. Done! A beautiful, restaurant quality looking and sounding dish. Thank you for sharing your recipe and technique. Just stopped back by to wish you Happy Holidays.